WILKENS is open for you every day, throughout the day from 11:00 hours. Follow the signs "Ausfahrt Kerpen" (Exit Kerpen) at the motorway junction “Kreuz Kerpen”. At the motorway exit Kerpen, follow the signs for "Kerpen-Zentrum" (Kerpen centre). At the roundabout take the second exit, (K 19 Kerpener Straße). Follow the road. After approx. 1.5 km, turn left into "Zum Breitmaar". We can also easily be reached using local public transport. Title: please select Mr. Mrs./Ms. * - All fields must be completed. Legal information: Many thanks for your visit. The Wilkens team is delighted by your interest in our Internet presence. Please observe the following information for the use of our information offers. Warranty: The information on this website has been compiled using the utmost care. Nevertheless, we cannot guarantee the correctness or accuracy of the information contained in it. Warranties or liabilities of any kind, e.g. for the accuracy, reliability, completeness and topicality of the information, shall be excluded insofar as this is not based on intent or gross negligence. Choice of law: The law of the Federal Republic of Germany shall apply. Information regarding data protection: Of course, we take the protection of your personal data seriously, and strictly observe the relevant data protection laws of the Federal Republic of Germany. Usage data: For technical reasons, it is inevitable that data is stored during the period of your access to our website, such as IP addresses (Internet protocol), date, time and viewed pages, length of stay of your visit, the website from which you came to us and technical data regarding the browser you used. We process this data exclusively for the purpose of enabling your usage of our offer. An assessment of personal data or the transfer of this to third parties does not occur. The data is exclusively further processed for statistical purposes, in order to improve the offers and design of the website. Entries in mailing forms: If you wish to contact us via email from the website, you can enter information regarding surname, name, street, post code, place, email, into the mailing form (email contact data). The email contact data and your message will exclusively be transmitted to Wilkens. Disclaimer: We herewith expressly dissociate ourselves from all content of linked pages on our website and do not adopt their contents. These contents are external contents in terms of §5 II TDG (German Teleservices Act) or MDStv (German State Contract for Media Services). This declaration is valid for all links attached to this homepage. The legal basis for the data processing is Art. 6 subparagraph 1 sentence 1 lit. f GDPR. Our legitimate interest follows from the purposes of data collection stated above. In no case do we use the collected data for the purpose of drawing conclusions about who you are. If you have questions of any kind, we offer you the possibility of getting in touch with us via a form provided on the website. A statement of a valid e-mail address is necessary so that we know who the inquiry comes from and in order to be able to reply to it. Further information can be given voluntarily. Data processing for the purpose of getting in touch with us is done according to Art. 6 subparagraph 1 sentence 1 lit. a GDPR on the basis of the consent which you have granted voluntarily. The personal data which we have collected for the use of the contact form are automatically erased after the inquiry you have made has been attended to. Your personal data are not forwarded to third parties for purposes other than those stated below. it is admissible by law and, according to Art. 6 subparagraph 1 sentence 1 lit. b GDPR, is necessary for attending to contractual relationships with you. We use "Google reCAPTCHA" (hereinafter "reCAPTCHA") on our websites. The provider is Google Inc., 1600 Amphitheatre Parkway, Mountain View, CA 94043, USA ("Google"). With reCAPTCHA, there is to be a check whether the data is input on our websites (e.g. in a contact form) by a human being or by an automated programme. For this, reCAPTCHA analyses the behaviour of the visitor to the website on the basis of various features. This analysis starts automatically as soon as the visitor accesses the website. For the analysis, reCAPTCHA evaluates various information (e.g. IP address, time spent on the website by the visitor or mouse movements made by the visitor). The data collected in the analysis are forwarded to Google. The data processing is done on the basis of Art. 6 subparagraph 1 lit. f GDPR. The website operator has a legitimate interest in protecting his web offers against misuse by automatic spying and against SPAM. Further information on Google reCAPTCHA and the Google data protection declaration can be seen from the following links: https://www.google.com/intl/de/policies/privacy/ and https://www.google.com/recaptcha/intro/android.html. Via an API, this site uses the Google Maps map service. The provider is Google Inc., 1600 Amphitheatre Parkway, Mountain View, CA 94043, USA. For the use of the functions of Google Maps, it is necessary to store your IP address. As a rule, this information is transmitted to a Google server in the USA and stored there. The provider of this site has no influence on this data transmission. Google Maps is used in the interest of an attractive portrayal of our online offers and easy tracing of the locations stated by us on the website. This portrays a legitimate interest in the sense of Art. 6 subparagraph 1 lit. f GDPR. More information on dealing with user data can be found in the Google data protection declaration: https://www.google.de/intl/de/policies/privacy/. according to Art. 77 GDPR to complain to a supervisory authority. As a rule, you can contact the supervisory authority of your customary residence or workplace or of the registered office of our law offices. To the extent that your personal data are processed on the basis of legitimate interests according to Art. 6 subparagraph 1 sentence 1 lit. f GDPR, you have the right to make an objection to the processing of your personal data pursuant to Art. 21 GDPR, provided that reasons resulting from your particular situation exist or the objection is aimed against direct advertising. In the latter case, you have a general right of objection which is implemented by us without a statement of your particular situation. 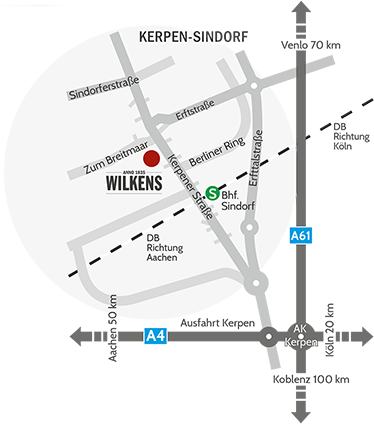 If you would like to make use of your right of withdrawal or objection, an e-mail to info@wilkens1835.de is sufficient. Within the visit to the website, we use the popular SSL (Secure Socket Layer) method in conjunction with the highest encryption level supported by your browser. As a rule, this is a 256 bit encryption. If your browser does not support a 256 bit encryption, we have recourse to 128 bit V3 technology instead. You can see whether an individual site of our internet appearance is transmitted with encryption by the closed portrayal of the key or lock symbol in the lower status line of your browser. In addition, we use suitable technical and organisational security measures in order to protect your data against chance or deliberate manipulations, partial or total loss, destruction or against unauthorised access by third parties. Our security measures are permanently improved in accordance with technological development. This data protection declaration is currently valid and bears the date May 2018. Due to the further development of our website and offers about it or on the basis of changed statutory or official requirements, it may become necessary to change this data protection declaration. The current data protection declaration at the time can be accessed and printed by you at any time under https://www.xyrechtsanwaelte.de/datenschutz .